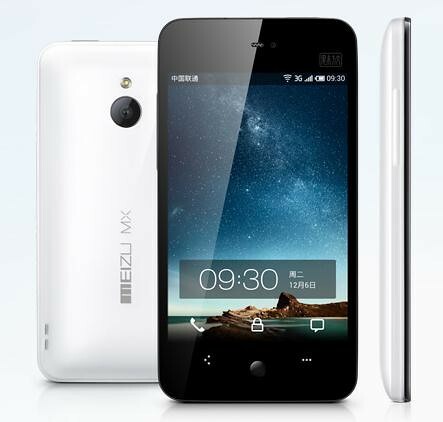 Meizu unveiled it’s new dual core phone MX which will be available in mainland China on January 1st, starting from ¥2,999 . Meizu MX features sharp ASV 4 inch 960x640 display, 1.4GHz Samsung Orion Exynos4210, dual-core Cortex A9, 1GB LPDDR2 1066 RAM, 16GB storage, 8 MP camera with a back-illuminated sensor, Micro USB2.0 (Supports S / PDIF OUT, USB HOST, MHL), 3.5mm stereo headphone jack, Dual-microphone active noise reduction and 1600 mAh lithium polymer battery. #Update Press release added after the break. Today Meizu unveils a new product, the Meizu MX. Borrowing the first two letters from the Chinese characters of the word "dream," or "meng xiang," the MX is a dream phone in all its senses. The MX comes with a dual-core 1.4GHz processor, 1GB RAM, 8 megapixel back-illuminated camera and LED flash, along with a gyroscope and other sensors. Its design is clean, intuitive and minimalistic, which is the result of countless discussions, prototypes, and revisions. The Meizu MX has a gorgeous 4-inch, high resolution (292 PPI) AVS screen with the ideal 3:2 aspect ratio. Compared to wider 4.3-inch screens, the screen edges are easily reachable with your fingers, while providing better readability for text; both in horizontal and landscape mode. In addition, the phone comes with Meizu's unique Flyme OS, which features a custom designed UI, as well as cloud services such as data syncing, music store (China-only), and an applications market. The Meizu MX also features a Meizu-only innovation, namely our patented situation-aware bottom light keys. MX offers ample connectivity and media sharing options such as a micro USB port, coaxial digital audio output, MHL, USB Host and other features. A 16GB version of the MX will be available January 1, 2012 priced at 2 999 CNY. With the MX, Meizu is taking its first steps into the international market. Meizu is opening a store later this month in Hong Kong, on Sai Yeung Choi Street, Mong Kok. Founded in 2003, we began producing music players which later came to be world renowned. Since 2008, all our efforts have been focused on making great smartphones, which have made us one of China's most loved smartphone makers. Since the beginning, something we have always held dear was the power of daring to dream. We believe in focus, in doing few things, but doing them really well. To us, focus is the key to achieving and exceeding our dreams. In focusing, our team is devoted, plans for the long-term, and strives for perfection. As a company, we want to transcend convention and imagination, with the ultimate goal of making products worthy of dreaming about.